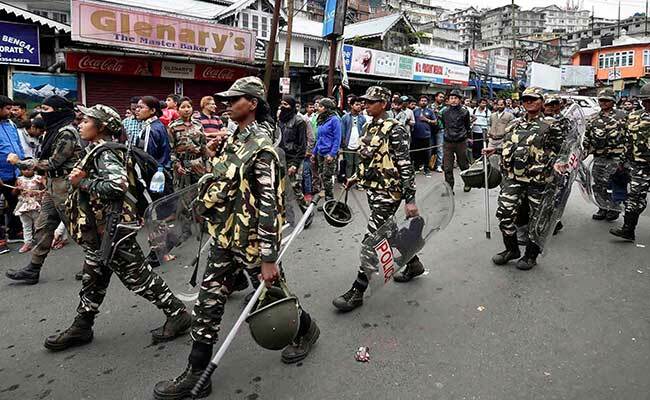 Darjeeling: A police officer was today stabbed by protesters during fresh clashes that erupted in Darjeeling after the son of a lawmaker was arrested and a senior Gorkha Janmukti Morcha (GJM) leader's house was allegedly vandalised last night. Both protesters and security personnel were injured in the clashes. A police vehicle was also set on fire by protesters. As GJM supporters threw stones, bottles and even petrol bombs at security forces prompting them to lathi-charge and use teargas shells, West Bengal Chief Minister Mamata Banerjee called it a conspiracy and said that "insurgency groups are supporting the GJM". "Whatever is happening is a deep-rooted conspiracy," Ms Banerjee told reporters at a briefing. The Chief Minister had initially said Assistant Commandant Kiran Tamang of the India Reserve Battalion was stabbed to death by the protesters. But she later clarified that he was critically injured. The Army had to be called in to control the situation. The police are on high alert and security forces are conducting route marches in various parts of the hills. Vikram Rai, head of GJM's media cell and son of Morcha's Darjeeling lawmaker Amar Rai, was picked up from his home around midnight. Mr Rai clarifies his son has no political affiliations. 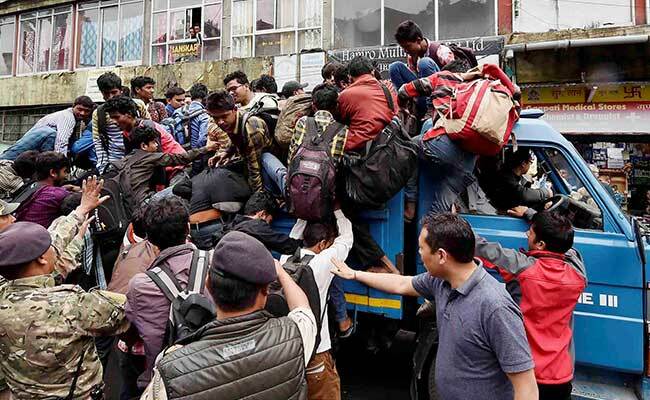 Whereas GJM's assistant general secretary Binay Tamang alleged that his house was "raided and vandalised by the police and the Trinamool Congress cadres" at 3 am in the same manner as they had raided party chief Bimal Gurung's house in Darjeeling district two days ago. "We are shocked that Vikram Rai, a local journalist, was arrested last night. Rai is associated with various media houses in Kolkata. If journalists are not safe in Darjeeling, who is," Mr Tamang said and added, "There is a virtual emergency imposed in Darjeeling region." A public works department office in Bijonbari was also allegedly set on fire by GJM supporters at 1 am. GJM supporters threw stones and petrol bombs at the home of Trinamool Congress activist Deoraj Gurung on Lebong Cart Road and attempted to set the house on fire, claimed Mr Gurung. 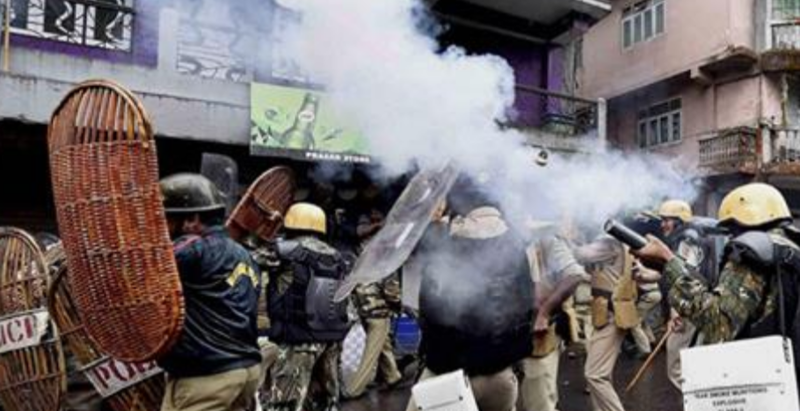 The indefinite bandh called by the GJM in Darjeeling, which entered the sixth day, has paralysed the hills. According to a railway official, the iconic toy train service of Darjeeling Himalayan Railway (DHR) has been suspended. Markets, shops, hotels and other business establishments, barring pharmacies, have remained closed. The GJM announced an indefinite general strike from Monday in the hills encompassing Darjeeling and Kalimpong districts and the Dooars (foothills of the Himalayas covering stretches of Jalpaiguri and Alipurduar district) protesting against Chief Minister Mamata Banerjee's decision to make Bengali language compulsory in state-run schools, but it has now escalated to the decades-old demand for a separate state of Gorkhaland.